Description: Cap: 5 to 25 cm, convex to flat, dry, white with inrolled margin when young, then yellow to orange brown stains; gills: white staining orange-brown, crowded, notched/attached, thick white veil; flesh: white, very firm; Stem: 4 to 16 cm by 2 to 6 cm, equal to tapered, white above and cap-colored below prominent ring; odor: strongly cinnamon plus dirt; taste: mild; spore print: white. Habitat: In/under duff on edges of Lodgepole/Ponderosa pine, White/Douglas fir, Hemlock forests. Edibility: Excellent. Complex and indescribable. Notes: This is our close cousin to the ‘true’ Japanese species, Tricholoma matsutake. However, species classification is in flux, and ours may change. In Japan, Matsutake symbolizes fertility and, by extension, good fortune and happiness. 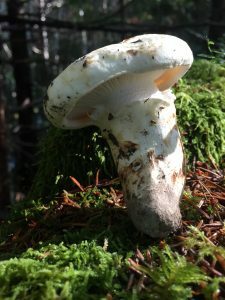 Much more information about Paific Northwest Matsutake is available at Matsiman.com, including habitat, timing, indicator plants and fungi, and a specific host plant – Allotropa virgata (Candy Cane), which parasitizes the mycelia. Set up steamer over lightly boiling pot of water. Marinate chicken & prawns in sake for 15 minutes. Drain thoroughly, reserving liquid. Whisk eggs in a medium bowl without creating any bubbles. Add marinade liquid, soy sauce, sugar and salt. Whisk together. Strain the mixture through a fine sieve into another bowl, again without bubbles. Divide chicken pieces into 4 chawanmushi or custard cups, or individual ramekins. Carefully pour mixture into the four vessels without creating any bubbles. Divide prawns & mushroom slices, tucking them vertically so some shows above the surface. Cover with aluminum foil or caps to prevent steam condensation. Steam cups for 25-30 minutes. Remove foil and add green onion the last 10 minutes then re-cover. Insert a skewer into the middle of the cup to check if the egg is done.